It’s warming up, the weather is clearing and the basket making fever is coming! 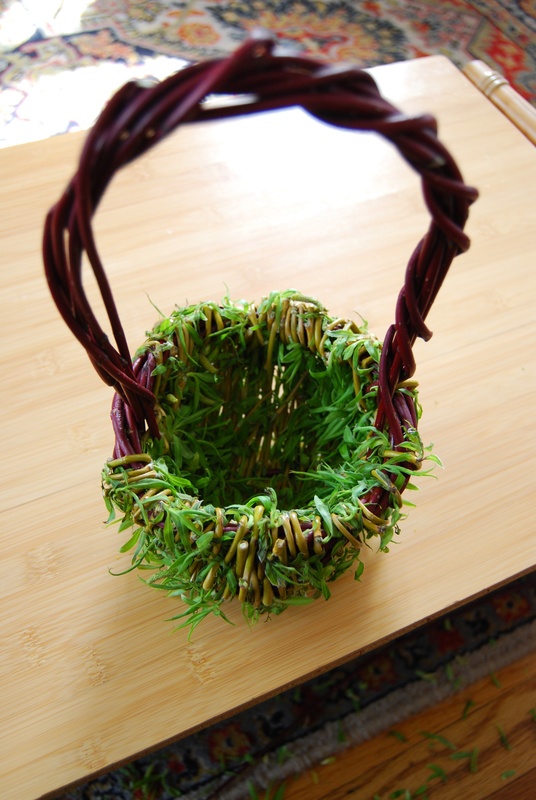 Making baskets is pretty straight forward but you do need some patience and a more materials than you would expect. To make a basket first make a good strong wreath out of the dogwood. 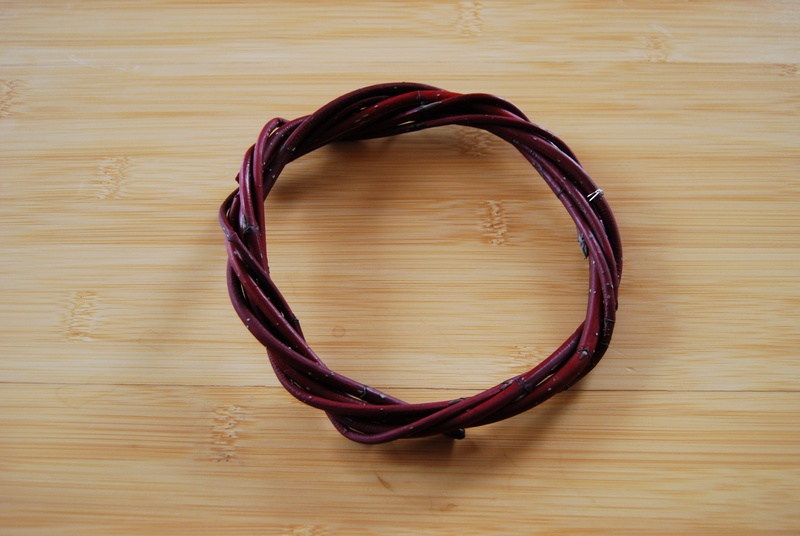 I often fasten one part with wire so the sticks will stay in place. Once the basket gets going you can remove this wire. This will form the top part of your basket. 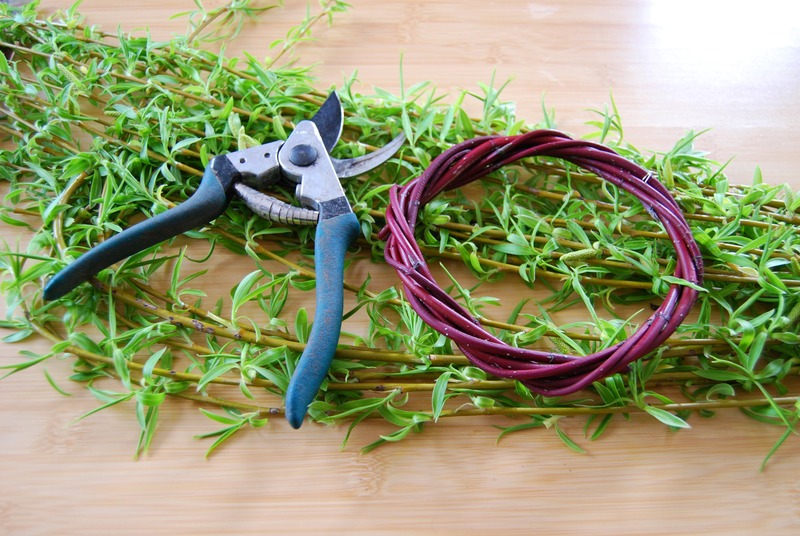 Next cut three sticks of the same size and wire or tie them in place on one side of the wreath. 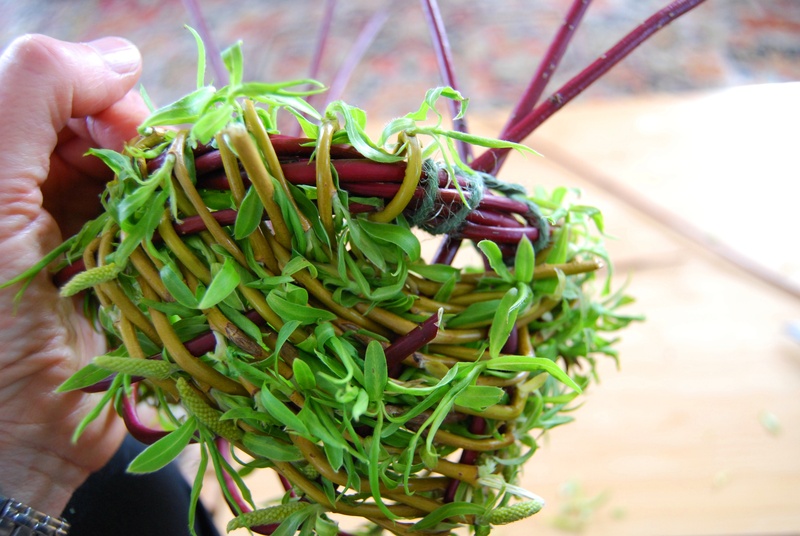 Carefully push these sticks down to form the downward shape of the basket and attach them to the other side as well. 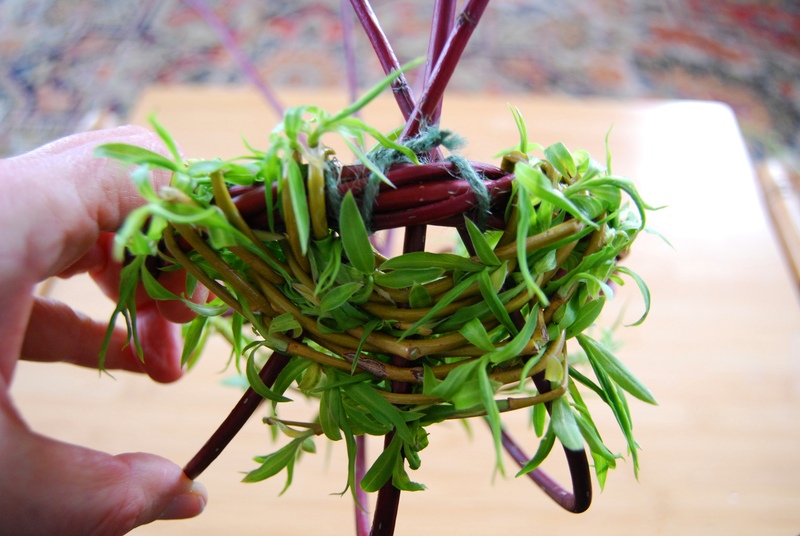 This is the first part of your basket structure so bend and move them into the shape you want. 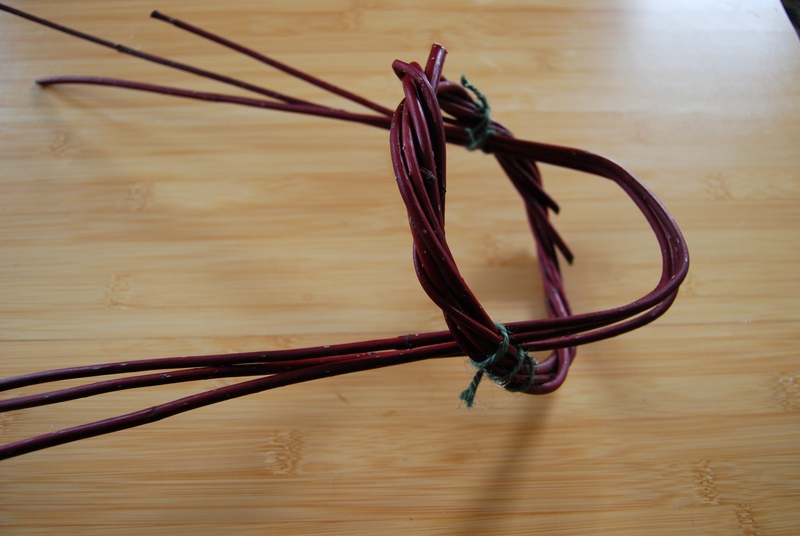 If you want to make a basket with a handle leave them long on the ends so they can be woven together. Supllies include willow branches, clippers and wreath base. Three central sticks attached to wreath with twine. The twine is removed once the basket is done. Weave the willow sticks over and under the three main dogwood sticks and wrap them around the wreath to weave in again. When you need to add in a new piece do it in the middle and not on the end. The leaves add color for a while but will dry and fall off eventually. Alternate from side to side. As you near the end you may need to just fill in the middle. Once the basket is done adjust it while the sticks are flexible. Ready to fill with eggs! A weeping willow tree with perfect branches for baskets. More on making baskets can be found in this earlier post. For those who get more interested in willow basketry, we are growing a wide selection of basket willows up in Skagit Valley. Willows are easily propagated from hardwood cuttings planted in the spring. There are some nice varieties that can be grown as coppiced plants in the garden or a border hedge that will produce rods for basketry or other garden uses like poles and trellises. You can find us on the web at dunbargardens.com. It’s great to know about this valuable resource. If you’d like to do a post about the various types of willow you have available. Send me an email at ankataa@yahoo.com.